Remember, it’s best to start your room decoration with a beautiful Dilmaghani rug! Put a template on the floor of the room to determine your size. It can be newspaper laid out in the size of your intended rug or masking tape. When you visit Dilmaghani, bring the range of sizes you like from the widest to the narrowest width and longest and shortest length. 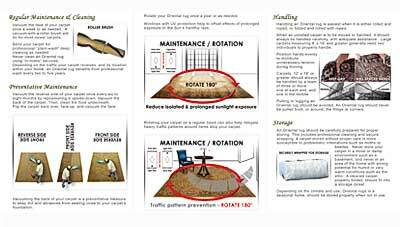 Allow space around the rug to frame it on your beautiful wood floor or specialized flooring. Rugs can go under furniture or in front of it. You decide! Great Rooms can accommodate a single Mansion Size rug, or several suitable smaller rugs defining particular sections of the room. Or, depending on your preferred sizes, you could select one central rug, with complimentary smaller accent pieces. For example, smaller rugs could be in front of a fireplace or a desk etc. For dining rooms, allow space for the chair to come away from the table and remain on the rug! Sometimes several rugs suit a large room as well as one large rug. Experiment with rug positions. Family rooms, libraries and bedrooms can have a single rug or smaller rugs surrounding the furniture. Entrance rugs introduce the quality of the home decor. A durable, handsome rug can provide a high level of service and immediate beauty to your home’s entrance. Hallways visible from the entrance also make a statement about quality and beauty. Check for door swings to accommodate the thickness of a rug. We are willing to send photos, as a prelude to your in-person selection, to customers who are serious about their rug search with Dilmaghani and able to give us parameters of design, color, size and price. Please fill in our Individual Carpet Inquiry form with your requirements. 2’6″ x 4′, 3′ x 5′, 4′ x 6′, 5′ x 8′, 6′ x 9′, 8′ x 10′, 9′ x 12′, 10′ x 14′, 12′ x 15′, 12′ x 18′, 12′ x 20′. Larger and unusual sizes are also available. 2’6″ x 8′, 2’6″ x 10′, 2’6″ x 12′, 2’6″ x 15′, 2’6″ x 18′, 2’6″ x 21′. Other lengths are available. Wide widths of 3′, 4′ and even 5′ are available in some designs. 3′ x 3′, 4′ x 4′, 5′ x 5′, 6′ x 6′, 7′ x 7′, 8′ x 8′, 9′ x 9′, 10′ x 10′, 12′ x 12′. 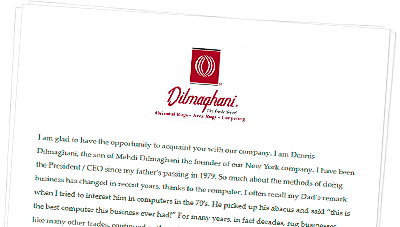 Dilmaghani has produced and maintains the largest inventory of Oriental rugs in the Tri-state area and one of the largest in the US. Rugs on our websites and rugs displayed in our Scarsdale showroom represent a very small fraction of our inventory. When you inform us of your specific requests, we will do a search through our inventory to find just what you are seeking. Dilmaghani is known within the rug industry for its incredible selection of unusual and oversize rugs. However, AN APPOINTMENT MAY BE NECESSARY if you are seeking rugs 12×15 or larger. Rugs of higher value are available only with advance appointments as they are typically off-premises in secured storage. Our inventory, manufactured specifically for Dilmaghani from all the rug weaving countries, consists of thousands of rugs spread out in numerous warehouses throughout the country. To schedule an appointment, please, call 914-472-1700. *Please note: for insurance reasons, children under the age of 12 are not permitted in the Showroom. Also read our Rug Buyer’s Guide.